It takes a village to prepare for a Special Olympics Illinois competition and the North Suburban Cook/Area 18 Spring Games were no exception. 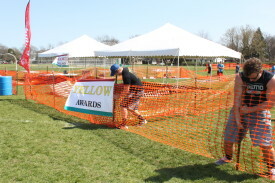 Amongst these volunteers were Austin Schwantz, a junior at Fremd High School, who recruited his fellow football teammates to help with set-up and tear down of Area 18 Spring Games at Prospect High School in Mt. Prospect. Volunteering is something Austin may have learned from his parents, Brenda and Jim Schwantz. Jim, a former NFL football player and current Mayor of Palatine, and Brenda have been involved in Special Olympics Illinois since his days with the Bears. “When he went to training camp in Plattville, the general manager at Eagle Ridge, would let the families stay there and he asked in return that we volunteer at the Winter Games,” Brenda explained. Jim has participated in the Torch Run Brenda even remembers volunteering in the 90-degree heat at Summer Games seven and a half months pregnant. Their involvement paused when they moved to Dallas, but they picked back up when they returned to Chicago. Mayor Schwantz started on the Special Leisure Services Foundation Board and served for over 10 years. He has also awarded Special Olympics Illinois teams and athletes with impressive achievements with proclamations. Special Olympics Illinois is so grateful for support from the Schwantz Family, and all those throughout the state who make giving back a family affair.